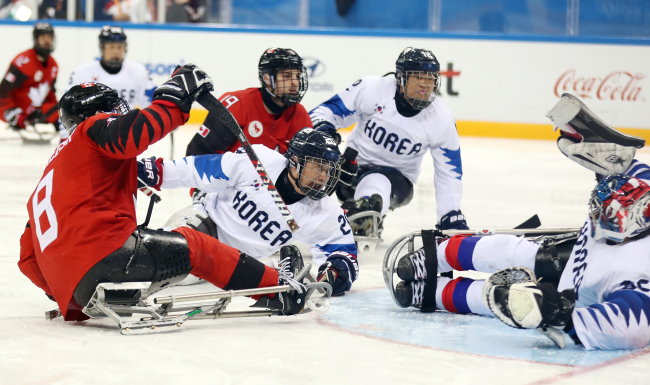 GANGNEUNG, Gangwon Province -- South Korea failed to reach the men's ice sledge hockey finals at the PyeongChang Winter Paralympics after suffering a 7-0 loss to Canada on Thursday. The men's team was blanked by top-ranked Canada at Gangneung Hockey Centre in Gangneung, Gangwon Province. With the latest result, South Korea extended its losing streak against Canada to 17 games. South Korea will play the bronze medal match Saturday against the loser between the United States and Italy. South Korea reached the semifinals as the second top performer in Group B with two wins and one loss. Canada, the 2006 Paralympic Games champion, was the top qualifier from Group A with a perfect record of three wins. The Canadians scored 35 goals and conceded none in the qualifying round. South Korea's defense couldn't contain Canada from the start as the host surrendered four goals in the first period, starting with Liam Hickey's scoring. South Korea managed to conceded only one goal in the second period, but the game was already fully controlled by the visitors. Tyler McGregor scored twice in the third period to seal an easy victory for Canada.